FIV is a slow-acting virus. It's a cat's version of HIV that results in AIDS for humans. People cannot catch FIV, so don't worry! Many times FIV is not detected until the cat has become quite sick. The virus reproduces inside white blood cells (the ones that fight infection) and spreads throughout the lymphatic system. Swollen lymph nodes and fever is the initial result. Over time, the immune system becomes increasingly weakened and the cat loses it's ability to fight even the simplest of infections. Healthy cats can fight off the normal bacteria, viruses, protozoa, and fungi of their environment but FIV cats become severely ill or can die from such infections. The most common means of transmission is through bites. Free-roaming and feral males who are aggressive (they bite and get bit) are at highest risk for getting and passing on FIV. A less common way of transmission is from pregnant mother to newborn/nursing babies. Recurrent illness or infections. Skin, bladder, and upper respiratory tract infections are common. Persistent fever and loss of appetite. Inflammation of the gums and mouth. Eye infections and other conditions. Progressive weight loss and eventual wasting away. 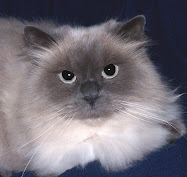 FIV cats are more likely to suffer from cancer and blood diseases. Miscarriages of litters of infected pregnant mothers. Seizures or other neurological problems. To diagnose FIV, the vet simply takes some blood to be tested in the office or a lab for the presence of a certain antibody. If the result comes up positive, then a second test (different method) will be ordered to make sure the first one wasn't a false-positive. Kittens born to FIV-positive mothers are not necessarily infected but must be tested every 60 days until they are at least 6 months old to be certain. A cat that have been infected within the previous 12 weeks might have a false-negative result because it's body hasn't started producing the FIV antibodies yet. If a cat has been exposed to an FIV cat or has gotten bitten or into a fight with an unknown cat, it should be retested again no later than 60 days from the incident. Two tests are best. Cats in the late stages of an infection have very weakened immune systems and may not be producing detectable levels of the antibody anymore. This would create a false-negative result. Keep your cat indoors and away from unknown cats. Never adopt a cat that hasn't been tested for FIV first. Cats that were feral or of unknown backgrounds/parentage should be tested twice for FIV before bringing them home. If one of your cats has FIV, it needs to be quarantined away from the other cats. Rough play or a fight could result in a bite which spreads the FIV to other cats. Gentle cats who don't play this way are less likely to spread the disease. 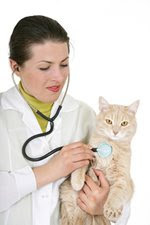 Make sure your cats receives its FIV vaccinations on schedule. Note-vaccinations are not a guarantee of protection but they do put the odds in kitty's favor. Keep FIV cats indoors and away from other cats and animals. They need to be protected from injuries, germs, viruses, bacteria, fungi and protozoa that might cause infections. Talk to the vet about spaying or neutering. No raw meat, eggs or unpasteurized dairy products. These items might have parasites or bacteria that an FIV cat is unable to fight off. Dry food is less likely to spoil or become contaminated while sitting out. Avoid canned food. See the vet every six months for a thorough checkup, blood count, serum analysis, urine test and weight check. FIV cats need constant watching because their health is always in jeopardy. Call the vet asap with even the smallest of concerns. Keep kitchen and bathroom counters and floors clean and disinfected. Take shoes off at the door and vacuum carpets often. Dirt brings in all sorts of nasty stuff. Wash and disinfect water bowl and food dish every day. Keep the litter box super clean and disinfect it once a week. The lifespan of an FIV cat depends upon how soon the disease is caught and the nature of the cat's infections. Some cats can live many more years under ideal conditions. After the passing of an FIV cat, the home needs to be cleaned up before a new kitty can join the family. It's not the FIV you will be cleaning up. It's the various germs that your HIV left behind during it's final months of poor health. Disinfect all kitty supplies by washing thoroughly with hot soapy water and drip drying. Give these items a second wiping down with bleach water and air drying. Throw away soft toys and get new ones. Spray cat towers and beds with a disinfectant spray. Give all floors a very thorough vacuuming or mopping.